Scientists of the CDF collaboration at the Department of Energy‘s Fermi National Accelerator Laboratory announced the observation of a new particle, the neutral Xi-sub-b. This particle contains three quarks: a strange quark, an up quark and a bottom quark (s-u-b). While its existence was predicted by the Standard Model, the observation of the neutral Xi-sub-b is significant because it strengthens our understanding of how quarks form matter. Fermilab physicist Pat Lukens, a member of the CDF collaboration, presented the discovery at Fermilab on Wednesday, July 20. The neutral Xi-sub-b is the latest entry in the periodic table of baryons. Baryons are particles formed of three quarks, the most common examples being the proton (two up quarks and a down quark) and the neutron (two down quarks and an up quark). The neutral Xi-sub-b belongs to the family of bottom baryons, which are about six times heavier than the proton and neutron because they all contain a heavy bottom quark. The particles are produced only in high-energy collisions, and are rare and very difficult to observe. Although Fermilab’s Tevatron particle collider is not a dedicated bottom quark factory, sophisticated particle detectors and trillions of proton-antiproton collisions have made it a haven for discovering and studying almost all of the known bottom baryons. 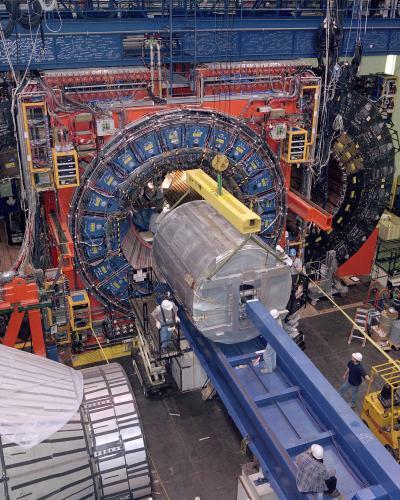 Experiments at the Tevatron discovered the Sigma-sub-b baryons in 2006, observed the Xi-b-minus baryon in 2007, and found the Omega-sub-b in 2009. The lightest bottom baryon, the Lambda-sub-b, was discovered at CERN. 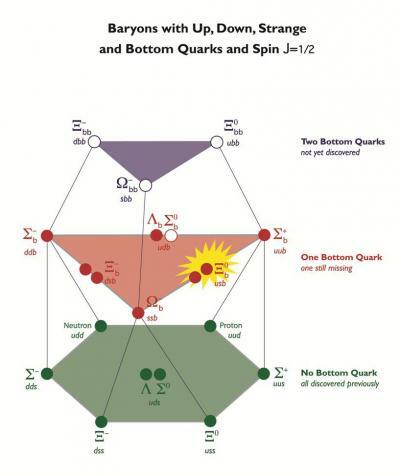 Measuring the properties of all these particles allows scientists to test and improve models of how quarks interact at close distances via the strong nuclear force, as explained by the theory of quantum chromodynamics (QCD). Scientists at Fermilab and other DOE national laboratories use powerful computers to simulate quark interactions and understand the properties of particles comprised of quarks. Once produced, the neutral Xi-sub-b travels a fraction of a millimeter before it decays into lighter particles. These particles then decay again into even lighter particles. Physicists rely on the details of this series of decays to identify the initial particle. 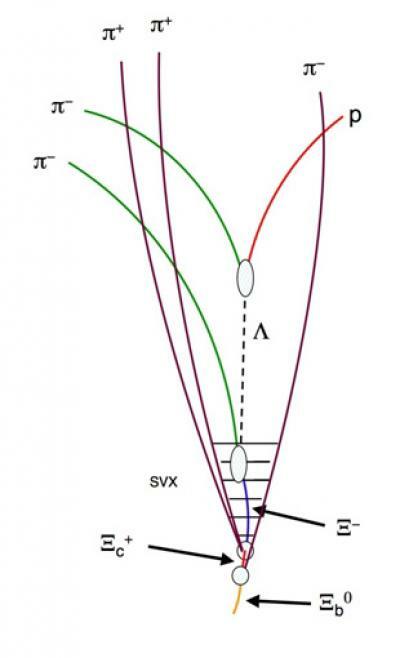 The complex decay pattern of the neutral Xi-sub-b has made the observation of this particle significantly more challenging than that of its charged sibling. Combing through almost 500 trillion proton-antiproton collisions produced by Fermilab’s Tevatron particle collider, the CDF collaboration isolated 25 examples in which the particles emerging from a collision revealed the distinctive signature of the neutral Xi-sub-b. The analysis established the discovery at a level of 7 sigma. Scientists consider 5 sigma the threshold for discoveries. CDF also re-observed the already known charged version of the neutral Xi-sub-b in a never before observed decay, which served as an independent cross-check of the analysis. The newly analyzed data samples offer possibilities for further discoveries. The CDF collaboration submitted a paper that summarizes the details of its Xi-sub-b discovery to the journal Physical Review Letters. It will be available on the arXiv preprint server on July 20, 2011.